Today I would like to talk about espresso, and specifically about preparing and serving a good espresso, or even better, a perfect espresso in your restaurant. We have had several great meals here in Anaheim, but we haven’t had any great espresso served at a restaurant. Every time, the espresso has been prepared and presented poorly. That means that we (coffee roasters) still have a lot of training to do to help the restaurant people prepare, serve and present a perfect espresso. Coffee roasters and restaurant owners need to work more closely together to establish guidelines and ongoing training for staff. It is with this final taste experience that your customers will leave your establishment. So, I would like to present a few tips on preparing and presenting this great drink that has become as popular in the United States as it is in Italy. The two most important considerations for a perfect espresso are preparation and presentation. These are very critical, especially after the coffee roaster has done so much work in choosing the beans, preparing the blend, roasting and packaging, and sending it to the restaurant. Once at the restaurant, the coffee also needs to be stored properly. Sometimes we talk about coffee as being similar to wine. A lot of time and expertise goes into creating a great bottle of wine, but once the wine has been shipped to the restaurant, it just needs to be opened. In the event a red wine is selected, you let it breathe and it is ready to pour. If the wine is good, if the winemaker did all the right things, you will enjoy a great bottle of wine. But for us, the coffee roasters, and for the coffee, it’s a different situation. There is art and science involved in choosing the beans, making the blend of coffee, roasting it to maximize flavor, packaging, storing, and sending it to the restaurant. What happens once it gets to the restaurant? In many restaurants our carefully roasted coffee is prepared with machines that are not clean, giving the espresso a burnt or bitter taste. The espresso is over-extracted or has no crema. The espresso is served without a demitasse spoon or sugar. For example, just this week, I had an espresso served with an iced tea spoon. I have seen a lot of things, but I have never seen that! At another 4-star restaurant, we had an espresso served in a cappuccino cup. The espresso was over-extracted, and was served without the sugar bowl or spoon, and a lemon twist. Just as you would never serve a steak without a steak knife, or wine in a tall water glass, there are guidelines to follow when serving espresso. Our task as roasters is to educate and inform so that this great drink is prepared and served in the best possible way. When we talk about espresso, we are referring to an Italian-style espresso made with a blend of coffee. A true Italian-style espresso or espresso all’Italiana, by tradition and definition, always means a coffee prepared with a coffee blend. An Italian-style espresso is one that follows the standards and guidelines established by two organizations in Italy: the International Institute of Coffee Tasters (IIAC), and the Italian Espresso National Institute (INEI). These two organizations have done extensive research with Italian consumers and professionals to establish exact guidelines for the typical Italian-style espresso. In Italy, we are very passionate about espresso. People have arguments in bars discussing how good or bad the espresso is or where to drink the best espresso in town. Sometimes, even in the bar around the corner from my house, if the young son of the owner is behind the bar, it’s not uncommon for customers to send him to get his father to prepare the espresso because they think the son can ruin the preparation. It is only one ounce of coffee, but it needs to prepared with passion and artistry. Carlo Odello of the Italian Espresso National Institute is here with us today. As an advocate for Italian-style espresso, he often explains that espresso needs to be a caress, not a punch. Espresso has a social aspect, and it needs to be very delicate. It has caffeine, but also needs to be well-rounded with a clean and elegant finish. Sometimes you get an espresso, and it really wakes you up, but is that the only reason we drink an espresso? At Caffè Umbria we follow the standards of the International Institute of Coffee Tasters (IIAC) and the Italian Espresso National Institute (INEI). These two organizations grade the espresso in four different areas: the visual aspect, the taste profile, the aroma, and the aftertaste. The visual aspect of an espresso is what the espresso needs to look like. It needs to have a rich brown (hazelnut) color crema, the crema needs to be dense and compact, without air bubbles. The crema should not show any white marks and should definitely not show liquid underneath. The aroma of an Italian-style espresso needs to be rich and intense but not have an overly roasted flavor, it should be of a full body, elegant and clean. The taste profile should be well rounded, with well-balanced acidity and bitterness. Bitterness is a component of the espresso taste profile, so it is not necessarily bad to have some bitterness in an espresso as long as it does not overwhelm. In many bars in Italy, it is the custom to serve a glass of water with the espresso, in order to rinse the palate prior to drinking the espresso, so that you will leave with the taste of coffee lingering on your palate. You should not have to drink the water afterwards to rinse out the taste of an espresso that was too strong, too syrupy, very bitter, or over-roasted. This is the after taste, which needs to be pleasant and clean, you should enjoy the lingering taste. I have talked about what an espresso should look like and taste like, and now I would like to talk about what you need in order to prepare a perfect espresso. Three things are essential to achieve the perfect espresso preparation: the coffee blend, well-maintained equipment, and trained baristas. You need to have good equipment that is well-maintained and clean. I often check espresso machines that have not been cleaned in months, that are not calibrated correctly, where no water passes through the screens. Good barista training is essential in order to achieve rapid and consistent results. After all, espresso means ‘veloce’, which means fast: espresso should be served fast and hot. This is manly the responsibility of the coffee roaster, the people that sell the coffee and implement the coffee program. Here in the United States, especially in coffee houses, coffee roasters have done a great job of training baristas in the last ten years, so you can get a really good espresso. We need to make this same sort of effort with the busboys, waiters, baristas, and anyone who prepares and serves espresso in a restaurant. As a traditional Italian-style coffee roaster, we prepare blends of coffees from different origins. In Italy, there is practically no market for single origin coffees; every roaster works with blends of coffee. They believe, as we do, that only in this way can you achieve a well-rounded, well-balanced, very interesting type of coffee for your espresso. To describe the difference between a single origin espresso and one made with a blend, it is useful to think of the difference between a soloist and a symphony: they are both good, but there is a difference between them. As roasters, we need to explain the importance of clean equipment on the restaurant owners. The responsibility for cleaning the machine should rest with the owners. The roaster should provide training, and can also lend their knowledge and experience in the choice of equipment. The type of equipment used in a restaurant or hotel facility is very important in order to achieve the best preparation. Our recommendation is for a restaurant is a regular espresso machine, but in meeting areas, convention centers, meeting rooms or other hotel facilities, perhaps it’s more appropriate to install a super automatic espresso machine or a machine that uses pods. Often the people making coffee in these areas are not as well-trained, so these machines will ensure a level of consistency. The most important on the list is the barista, as he is the one that is going to put it all together. Barista training is one of the expectations that the restaurant owner should have from their coffee company. The training should include good knowledge of the coffee they are serving, the maintenance and cleaning of the machine, and of course drink preparation. Baristas should know what the coffee tastes like. Often the people serving the coffee don’t like coffee, or don’t drink coffee, but I think it’s important for them to taste it in order to prepare it properly. Finally, once all the pieces are in place, we are ready to present the espresso. The espresso should be the last thing that is served at the table, after the dessert. If the customer asks to have them served at the same time, we should comply, but we should avoid serving the coffee before the dessert. The espresso should be the last thing that is served before you leave the table. A proper presentation of the espresso includes a saucer, a demitasse spoon, and sugar served on the side. Unfortunately, I have had some restaurants serve the espresso without a saucer. One of my pet peeves is to have rock sugar served with an espresso. The rock sugar looks great, but how long does it take to melt the sugar in the espresso? You have to pound the rock sugar with your teaspoon for minutes in order to dissolve in the liquid, and by the time the sugar is dissolved the espresso is cold. If you are serving rock sugar, at least give the option of regular sugar so I can decide if I want a nice rock sugar and cold coffee, or if I want regular sugar in a nice hot coffee. Another thing that I have never seen in Italy or anywhere else but here in the United States is the lemon twist served with the espresso. Ah, the lemon twist was big in some nice restaurants, right? I can tell you that lemon doesn’t have anything to do with an espresso, so please do not serve lemon twist with the espresso, save it for the cocktails. Espresso, Macchiato, Cappuccino, Caffè Latte, Latte Macchiato, Mocha and Americano. The espresso drink you don’t see often over here is the Latte Macchiato. It is popular in Europe and in Italy, and it’s the opposite of Espresso Macchiato. Macchiato means stained, so an Espresso Macchiato is an espresso that has been ‘stained’ with milk. Latte Macchiato, for those people who don’t want to have too much espresso or caffeine, is a glass of steamed milk with a very short shot of espresso on top. The espresso shot poured over the milk leaves the stain of the crema on top. You can also have an espresso specialty drink menu. Some of the drinks popular from Italy are: Marocchino, Espresso Corretto and Affogato al Caffè. Espresso Corretto is my personal after dinner favorite. It is an espresso ‘corrected’ with a splash grappa or Sambuca. Affogato al Caffè is a good combination of dessert and coffee: a nice cup of vanilla gelato ‘drowned’ with espresso. There are also several espresso cocktails that will work well in a restaurant setting. For example, the Espresso Martini, the Mojito, Espresso Saronno (very traditional in Italy with Amaretto di Saronno liqueur), American Wings and Caffè Olandese (made with an egg liqueur like Vov). The Perfect Espresso, a combination of the right blend of coffee, good equipment, excellent training, and a beautiful presentation (don’t serve it with an iced tea spoon). I hope I gave you some insight about espresso all’italiana. 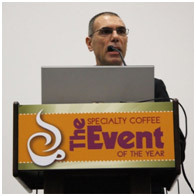 * Transcript of the presentation held at the SCAA Exhibition 2010 in Anaheim, California. Pasquale Madeddu is a coffee taster and the sales manager of Caffè Umbria. Equipped with a state-of-the-art roaster and a great passion for blending and roasting, Caffè Umbria produces five boutique Italian-style blends, including the classic espresso blend, Gusto Crema. Thanks for the article. It sounds like you know your espresso well, but I want more details on how to prepare the perfect espresso. What should I look for in a blend? Should I buy single variety beans and blend myself? What’s the proper grind? How do I get the ideal extraction? I’m terribly disappointed with espresso in America. It’s so much better in Italy and I want to find that here… and if I can’t find it, I’ll create it.